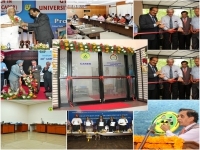 The Centre for Advanced Research in Environmental Radioactivity (CARER) was established by the Mangalore University as a NATIONAL FACILITY through the financial support of the Board of Research in Nuclear Sciences (BRNS), Department of Atomic Energy, Govt. 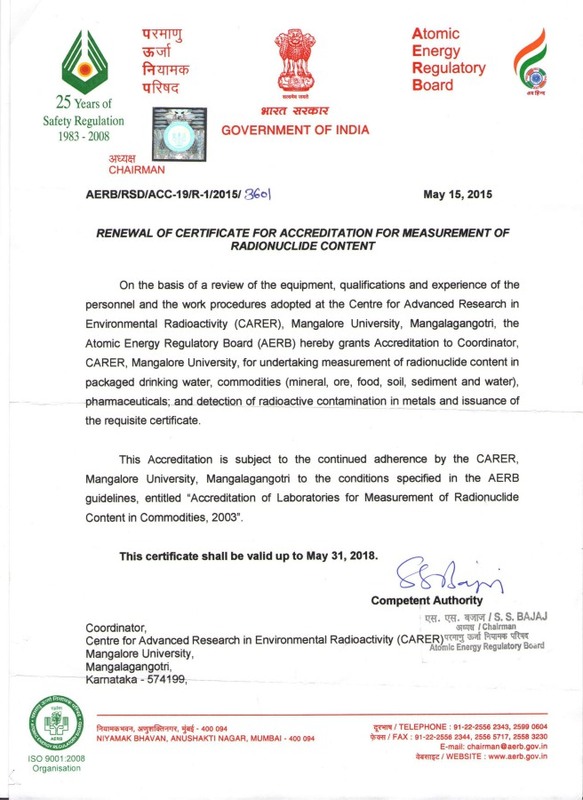 of India, and technical support from the Bhabha Atomic Research Centre (BARC). 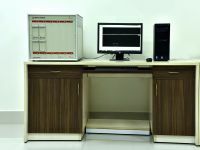 This is the most advanced laboratory/centre for radioecological and radiation protection research in the the University system in India. 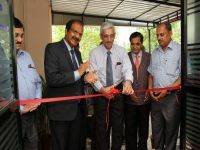 The centre is engaged in frontline research on radioecology and environmental radioactivity in collaboration with BRNS, BARC, Indira Gandhi Centre for Atomic Research (IGCAR), and Nuclear Power Corporation of India Ltd. (NPCIL). The CARER has 6 laboratories with state-of-the-art facilities for radioecological studies. Liquid scintillation spectrometry, Carbon-14 and Tritium measurements laboratory, Alpha spectrometry laboratory, Gamma spectrometry laboratory, Radon laboratory, Sample processing laboratory and, Laboratory for simulation studies on deposition velocity, deposition rate, and mass interception factors of radionuclides. These facilities are being extended for researchers from national and international laboratories, universities and institutions, and industries. CARER has been developed as a national centre and is targeting for recognition as an IAEA training centre for scientists from its member states, ISO certification, and increasing national and international collaborations. The centre has well- set programmes to conduct advanced studies on dynamic transfer factors, spike experiments, radioactive aerosols, simulation studies, developing new techniques for radiation measurements, and to generate well- trained human resources.